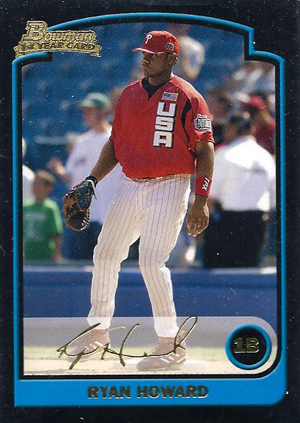 Like many prospect-driven sets, 2003 Bowman Draft Picks & Prospects Baseball has seen its share of boom and bust rookies. Things have largely settled now and a few big-time standouts remain. Combine those key cards with a growing number of inserts and hits, and the result is an enduring set that stays true to the Bowman brand. 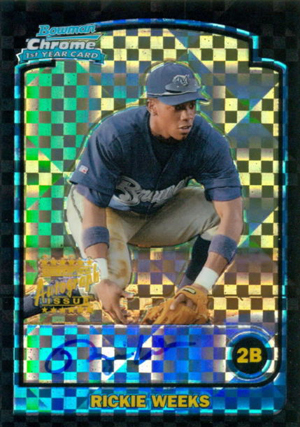 For the second straight year, 2003 Bowman Draft Picks & Prospects Baseball combines both Bowman and Bowman Chrome into a single release. Seven-card hobby packs come with four Bowman, one Gold parallel and two Bowman Chrome cards. Hobby boxes have 24 packs and promise one autograph and one memorabilia card. The first 165 cards in each set mirror one another. 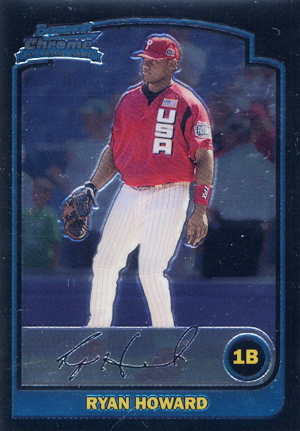 2003 Bowman Chrome Draft Baseball also has 11 autographs numbered 166 to 176. 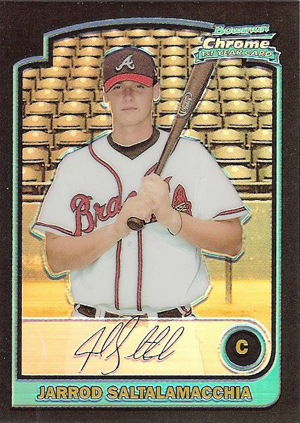 The Bowman cards are paralleled by only the one-per-pack Gold cards. Bowman Chrome parallels include Refractors (1:11 packs, Autographs: 1:196 packs), X-Fractors (#/130, Autographs: 1:393, #/250) and Gold Refractors (#/50). 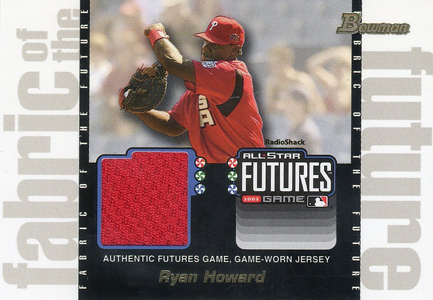 The two biggest rookie cards in 2003 Bowman Draft Picks & Prospects are Robinson Cano and Ryan Howard. Other highlights include Jonathan Papelbon, Jarrod Saltalamacchia and Aaron Hill. Nick Markakis has just two total rookie cards and one of them is a 2003 Bowman Chrome Draft autograph. Delmon Young is the other key signature in the set. 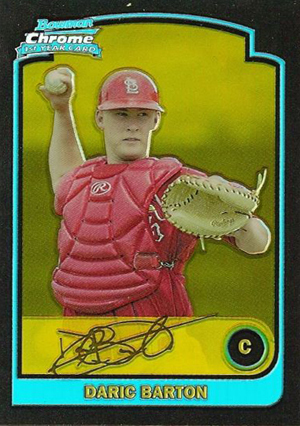 As usual, the Bowman Chrome versions command a premium over the basic Bowman cards. 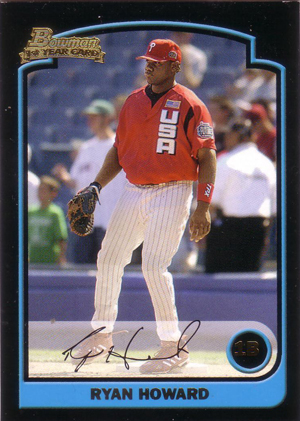 Compared to more recent releases under the Bowman Draft banner, 2003 Bowman Draft Picks & Prospects Baseball has numerous autograph and game-used sets, however few stand out today. Signs of the Future is a five-card autograph set. The only really notable player is Zack Greinke. Fabric of the Future includes jersey swatches from the MLB Futures Game. Cano, Howard and Joe Mauer are the key players. 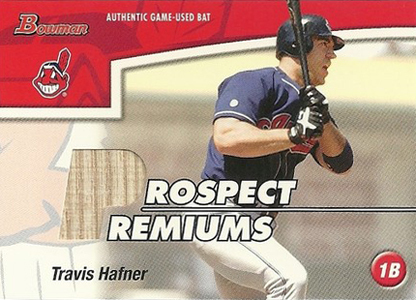 Prospect Premiums have game-used bat pieces from the likes of Chase Utley, Justin Morneau and Travis Hafner. 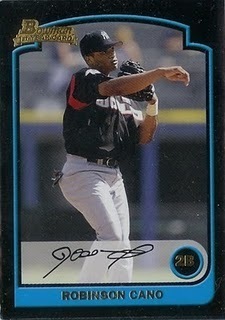 2003 Bowman Draft Picks & Prospects Factory Sealed Hobby Box Robinson Cano RC ? ?